FAQ: Do your dog's paws smell like popcorn? When walking Lucia, the people I meet often range from beat to elite..
"Lagrima" is Italian for "tears", and she's so named because the markings beneath her eyes looks like she's smeared her mascara from crying. Lucia came from a shelter, and Murray san made her his own. He's a veteran musician who's been creating music of all types, including some major commercial themes. Nowadays, this dog's become a sort of old hand in the music "biz" who accompanies her partner to the studio every morning. 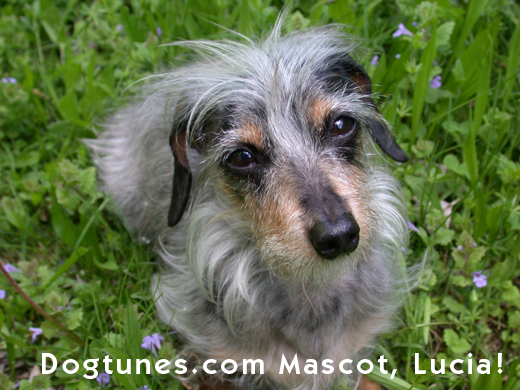 In fact, [Lucia's] sort of become everyone's canine muse. She's modeled for and graced the cover of an upscale department store catalogue. She's even inspired her own song, Lucia, Blue Dog. Murray san has been deeply devoted to charitable activities that impact the well-being of the greater canine community. And all the while Lucia stands at his feet, cheering him on. She's a fount of good spirits for all. 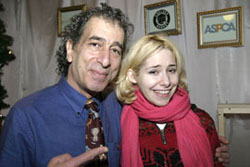 Musician in the pop and rock fields since the 60's, especially in and around New York City. Also known for his dog advocacy on behalf of bringing dogs a better tomorrow. These activities include networking and promoting shelter information around the region. 1. 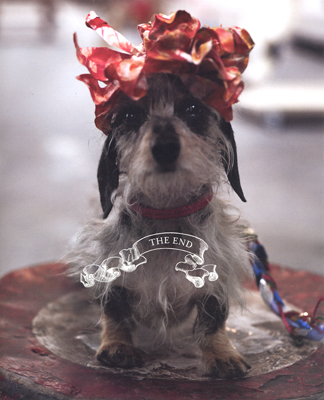 CD "The Dachs Song" was created for the annual Dachshund Parade in Washington Square Park. 2. "Tails of the City" is filled with songs written from a dogs-eye view. Bergdorf Goodman's Spring 2008 cover girl, LUCIA LAGRIMA! We are very excited at Dogtunes.com to announce that our rescue dog and mascot, LUCIA LAGRIMA is now a cover girl for Bergdorf Goodman! Many thanks to her dedicated fans who have made her a star. She looks up to all of you. 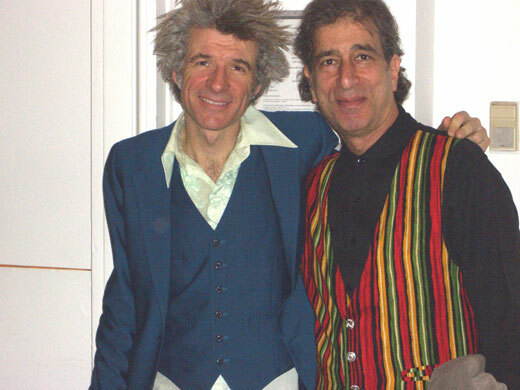 Dan Zanes and "Nueva York" fan, Furry Murray Weinstock. Dan Zanes is the Pied Piper, with music that literally turns any group of people into a "dance party!" On February 24th at the Brooklyn Academy of Music, there was a sold-out concert filled with the young and the young at heart, and I was one of them. Dan started out the concert by asking the question, "Is this going to be a concert where you sit in your seats or is this going to be a WILD dance party?" After the shouts of joy, scores of parents and children walked up to the area just in front of the stage. And the Brooklyn party began. 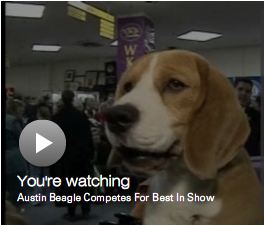 Below is a link to a recent CBS-TV report on the 2008 Westminster Dog Show! You will see UNO, 2008 winner of Best in Show followed by Furry Murray Weinstock singing The Dachs Song along with Champion Dachshund breeder and Dachshund Friendship Club member, Emma Jean Stephenson. It's Murray Weinstock, AKA Furry Murray of Dogtunes.com to share a bone with you! I have created music for this concert and wanted to let all of you know about it. It is very good and funny and has a team of 7 human "puppies" ages 5-12. See what The New York Time Says! Mary Seidman has spent a lifetime watching dogs, to judge by her charming new “WeDOGS,” performed on Sunday afternoon at the Ailey Citigroup Theater. See what The Daily News is talking about! The choreography and language of one local dance company has cleverly gone to the dogs. 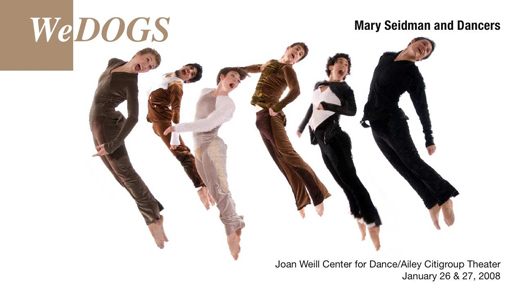 Saturday and Sunday, Mary Seidman & Dancers will present the world premiere of "WeDOGS," a dance in six parts that celebrates the unrelenting spirit and boundless emotional capacity of man's best friend. 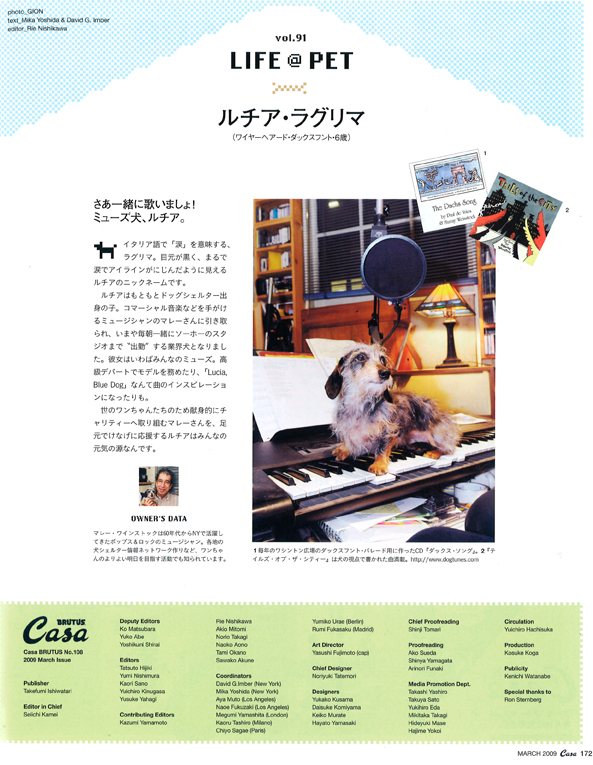 DOGTUNES in November's COOL Pet Products page! On November 29th, DOGTUNES' FURRY MURRAY WEINSTOCK will be performing at The North Shore Animal League's 2nd Annual DogCatemy Awards Gala emcee'd by ABC-TV GOOD MORNING AMERICA Weather Anchor SAM CHAMPION! Furry Murray and the Bow Wows do some waggin' and wailin' in the City of Brotherly Love! Click for video! My Dog Loves Central Park Country Fair! 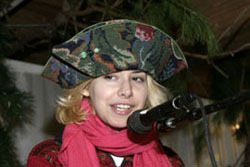 Animal Fair's lovely Wendy Diamond. Alas! 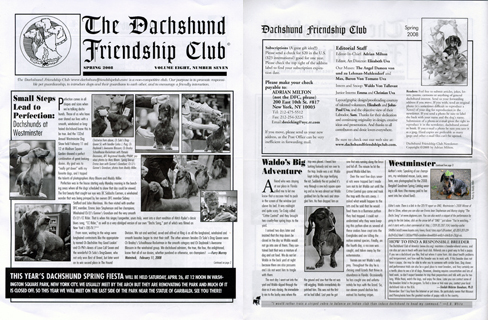 It is the same date as The Dachshund Octoberfest in Washington Square Park put on by The Dachshund Friendship Club! So many places to play the accordion! Shea Megale and her Marvelous Mercer meet Furry Murray! Just out from Mordecai Siegal, "Dog Spelled Backwards: Soulful Writing by Literary Dog Lovers.” (St. Martin's Press, $23.95) This book includes fiction and nonfiction selections like "Old Dog Tray” by Stephen Foster, "Angels on a Leash” and "My Buddy” by Murray Weinstock, "A Prayer for Animals” by Albert Schweitzer, "Memoirs of a Yellow Dog” by O. Henry, "To Flush, My Dog” by Elizabeth Barrett Browning and "That Spot” by Jack London. Click the NewsOK.com logo to read more about the book. Furry Murray and The Bow Wow Band will be going to Mordecai Siegal's hometown of Philadelphia on September 8th, back by popular demand to perform songs from Tails of the City in Philadelphia's Rittenhouse Square Park. Special thanks to Commerce Bank, for sponsoring The Carnivale for the Dogs, an event that will include dog psychics, dog caricature artists as well as dog agility demonstrations and a doggy costume parade! The Dog Day Afternoon will start in the morning at 10:00 AM! Event planner Kimberly Schlegel Whitman, who wrote "Dog Parties: Entertaining Your Party Animals," told co-anchor Julie Chen on The Early Show Tuesday that it's not difficult to put one together. Now treating the pooch to a day of beauty is the preferred way to express devotion. Play soothing music to relax both your pet and human guests alike. Try "Roll Over Beethoven," "Tails of the City," and "Pet Melodies." Hear NPR's Melissa Block interview Murray on "All Things Considered"
Canadian Broadcasting Company (CBC) asks Murray:Why DO dogs smell like popcorn? Go to the scoop for the answer! Dan Zanes , "Tails of The City CD. It's great. Congratulations! I'm sure you've improved the lives of dogs and their people everywhere!" Liz Smith, "As the co-owner of Dachsmith-Love Kennel for champion smooth hairs, I do applaud The Dachs Song. I sing it night and day. Arf." Bruce Vilanche comedy writer, "LOVE this dog album. So did the pugs -- Tallulah and Hattie!" Van Dyke Parks, songwriter/arranger/producer (co-writer of The Beach Boys' hit song Surf's Up, as well as Heroes and Villains and Vegetables from Smiley Smiles.) "Arf! Decent to the bone. Gave me pause. Put warp in my woof and made my day." Hear Murray sing The Dachs Song. Lucia and I were fortunate this past Saturday to catch a packed reading at FAO Schwartz of an inspirational, kid's book called Marvelous Mercer. It is the brainchild of a cheerful, 12 year old author named Shea Megale, who has a condition called Spinal Muscular Atrophy Type 2 that keeps her confined to a wheel chair and dependent on her assistance dog named Mercer! This does not hold Shea back from her dreams which are expressed in the first of 6 stories that have Mercer learning how to ice skate and more. 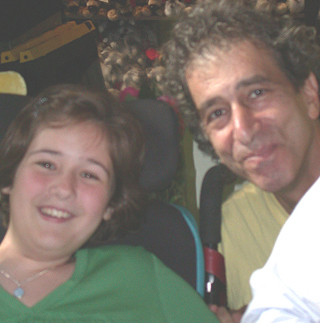 Here I am with Shea, who told me, "I love your music, Furry Murray!" 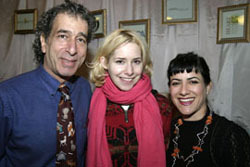 McKay performs her very special "Dog Song"
Broadway Star and Recording artist Nellie McKay and composer, Murray Weinstock at the opening ceremony of Rational Animal's Gingerbread Homes for the Animals holiday display at Chelsea market. It is a winter wonderland of animal inspired gingerbread creations by New York's top pastry chefs with a portion of the proceeds donated to The Picasso Veterinary Funds. 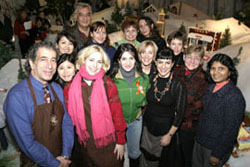 Shown below, they performed Recipe of Love, a special song Weinstock created for the event. Dogtunes.com has a new Mascot! Lucia, a 6 1/2 lb. 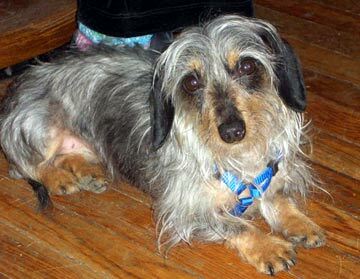 wire-haired Dachshund who came to us through the courtesy of The SPCA of Briarcliff Manor. On November 29th, FURRY MURRAY WEINSTOCK and famed Bow Wow DIVA DAWG, ELAINE CASWELL will be joining ABC-TV GOOD MORNING AMERICA Weather Anchor SAM CHAMPION, Fox 5's Entertainment Reporter, ANTONIA "TONI" SENECAL, and North Shore Animal League spokesperson BETH OSTROSKY for The 2nd Annual DogCatemy Awards Gala to be held at NYC's Soho hot spot, Capitale. FURRY MURRY and DIVA DAWG, Ms. Caswell will be performing songs from their CD, Tails of the City! The awards CATegories will be for Best Pawformance" "Best Dogumentary" "Best Tail-Waggin’ Comedy," "Best Musical," & "Best in Show"! New York City, W Hotel - February 5, 2007. Angel on a Leash's theme song made its debut last night at the kick-off party for The Westminster Kennel Club's 131st Annual Dog Show. Click here to listen to the song and download the lyrics. Saturday, October 14, 2006 at historic Lyndhurst mansion in Tarrytown, NY. Stockard Channing hosts Top Hat & Tails Fundraiser.....Furry Murray Weinstock & The Bow Wow Band will provide Dog Tunes for dancing! Click here for more information. We proudly present "Tails of the City"
on Lovenotes Records, as featured on dogcatradio. "Tails of the City" is an assortment of songs about dogs from a dog's point of view and features Dr. John, Phoebe Snow, John Sebastian, Joey Spampinato, Joe Lynn Turner of Rainbow, Johnny Farina, & The Toys' Barbara Harris. I was inspired to write this project from my experiences with my Dachshund, Sparky. In my effort to truly understand him, I searched out scenarios of what he was thinking, feeling, smelling or looking at. I expanded the idea to be about all dogs! This is not geared to any shape, size or color of dog, but is a non-denominational project. No animals have been harmed, but some hearts may hurt a little! 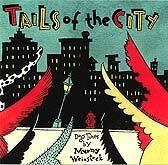 Great quotes from listeners of "Tails of The City": Doggone good, Murray. I've listened to your CD many times now and am even fonder of it than on first listen. Great polished musicianship, great compositions, witty lyrics. FOUR PAWS UP!- John Grogan, author of "Marley and Me "'I've been playing "Tails of the City" every morning, bouncing around the house with Sophie, my Australian shepherd mix, whoidentifies with your work completely.' - Armistead Maupin, author of "Tales of The City"
NEW FEATURE - Give the gift of SONG! t, the song will include the name, physical type, and any special personality traits, good or Celebrate your pet's birthday in a special way. Your very own custom-made song of any style can be created about your dog or cat. Unique to your pebaaad! And on another note - click here to see streaming video of Murray in the feature movie "Looking For An Echo" starring Armand Assante.